Warwick, RI – June 12, 2017 – Antaya Technologies is proud to announce the consolidation of our three RI locations into one state of the art facility in Warwick, RI. This new location will serve as global headquarters for the Antaya business as well as the primary manufacturing facility to support secondary locations in Europe and China. This move will allow Antaya to continue to grow as a key player in the on-glass connections industry and also demonstrates our commitment to further increasing our manufacturing capabilities. 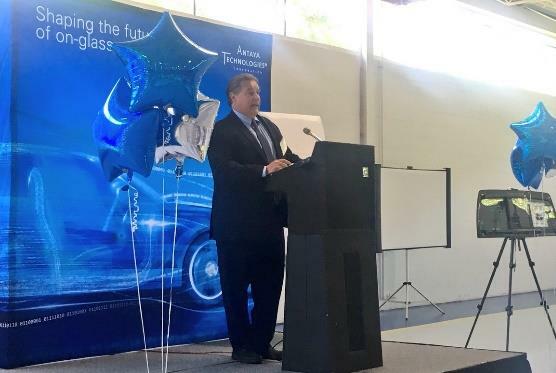 On June 9, 2017, Antaya Technologies hosted the Grand Opening of the new facility. We welcomed RI Secretary of Commerce, Stefan Pryor, who spoke about Antaya’s contribution to the exciting growth of manufacturing in the state. He highlighted how Rhode Island’s strong economy is a catalyst for growth for businesses like Antaya. We also welcomed employees from our parent company, Delphi, including President of the Connection Systems division, Enrique Orta. Enrique expressed Delphi’s commitment to supporting Antaya’s global growth and praised Antaya’s business model for being highly customer-focused. In addition, we were pleased to welcome our valued customers and suppliers to the new facility. “Antaya has come a long way in these past thirty years, and I know my father would be proud at what we have accomplished” said Stephen Antaya, whose father Donald Antaya started the business in 1987. Stephen spoke enthusiastically about his father’s commitment to innovation and how his entrepreneurial spirit along with Stephen’s focus on statistical analysis fostered the strong relationships we have with our customers today. “We would get in the car and drive. All over the country and even up to Canada.